Agribusiness Boom Brings Change to the Amazon An agribusiness boom is turning millions of acres of Amazon rainforest into a tropical version of Kansas. NPR's Martin Kaste has the first of two reports. Highway 163 was cut through the jungle in the 1970s to connect the Amazon to the rest of Brazil, but the job wasn't completed. 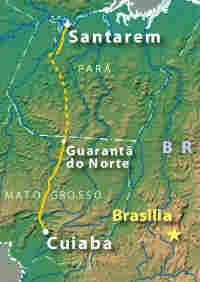 Under pressure from agribusiness, the government plans to pave the remaining 600 miles north of Guarantã do Norte. 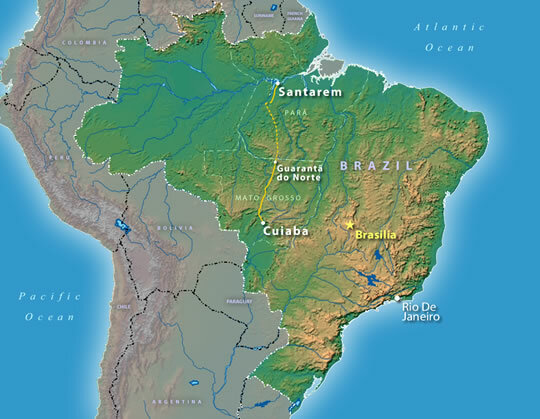 Brazil is in the midst of an agribusiness boom. Vast farms of 10,000 or 20,000 acres are churning out soybeans and other commodities for the world market. That's good news for the country's balance of payments, but it's also turning millions of acres of Amazon rainforest into a tropical version of Kansas. NPR's Martin Kaste has the first of two reports.